We've been trying to use this antibody as a loading control, but despite using BSA in the blocking solution, as recommended, the background is very high, and the blots are poor in quality. Could you give us any advice on how to improve this? Or alternatively, I think we should either get a new antibody free, or a refund. The data you show on the web looks good, and that made us want to try this antibody, but it's not living up to expectations. I am sorry to hear you have been experiencing problems with one of our antibodies. The quality of our products is important to us and I would like to reassure you that we investigate all customer complaints. I appreciate the time taken to submit further information to us, and after reading the answers provided I would like to ask some additional questions. What type of sample are you using (Species/Cell extract/Nuclear extract/Purified protein/Recombinant protein etc.) and how is the sample prepared (Buffer/Protease inhibitors/Heating sample etc.)? How much protein is loaded in each well? You mention BSA blocking, have you tried other blocking conditions or periods? How much primary antibody did you use? How long and at what temperature was this incubated? What dilution and incubation did you use your secondary antibody at? What detection method do you use (ECL, ECLPlus etc.)? Have you run a no primary antibody control? Do you obtain the same results every time (e.g. are the background bands always in the same place)? Thank you for your inquiry. We do not assign strict expiration dates for our products, however we follow general guidelines: Antibodies stored at 4C may be viable up to 1 year, those stored at -20C may be viable for up to 5 years, and those stored at -80C may be viable for up to 10 years. We guarantee our antibodies for tested species and applications for 12 months from purchase under the Abpromise guarantee. You recommend BSA for the blocking step, not milk. However, in previous Abreviews I have seen that customers successfully used milk rather then BSA. You are right in stating that customers have reported successful experiments using milk as a blocking agent. We have however changed our production methods for this monoclonal antibody and this appears to have altered the affinity of the antibody somewhat. We now strongly recommend using BSA instead of milk, as in our hands this is the only way to obtain optimal results. 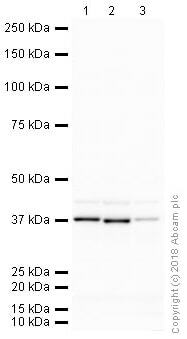 This antibody was replaced with yet another lot and is still not working for me. I submitted a full report and am awaiting a new log. For now I've switched to actin for my loading controls. I would highly recommend that you stop selling with antibody since I've tried three lots and none have worked as previously reported. I submitted a review when this antibody worked perfectly and now I don't get any bands even after an overnight exposure. I look forward to hearing back with an estimate arrival time for the new lot. Many thanks for your valuable feedback on your recent experience of ab9484. In light of your feedback and that of several other customers we have removed all stock of this antibody and are offering our apologies for this unusual problem and a refund or replacement vial of another antibody. We have found that some customers are having difficulty with this product, while others are delighted with the same lot, we are very puzzled as to the reason for this and are investigating this extremely seriously in the laboratory. The quality of our antibodies is of utmost importance to us and we are very concerned about this case. We do not have an expected date for the new lot and therefore I would like to offer you a refund on your orders or three free vials of our other polyclonal anti GAPDH antibodies: https://www.abcam.com/index.html?datasheet=9483 https://www.abcam.com/index.html?datasheet=9485 I look forward to hearing from you regarding which you would prefer as well as your details of your orders to arrange this for you. Once again please accept our apologies for this unfortunate rare event, I hope this will not deter you from purchasing from Abcam in the future. What exactly is the difference between these two antibodies? The only difference between these two antibodies is that ab9482 is the HRP-conjugated version of ab9484. The advantage of ab9482 being HRP-conjugated is that there is no need for a secondary antibody. I'd like to know the data source for the statement that for some physiological factors (especially diabetes) the GAPDH expression is increased. The ab9484 I am interested in is a IgG2b- can I use a secondary anti-mouse IgG (H+L)?